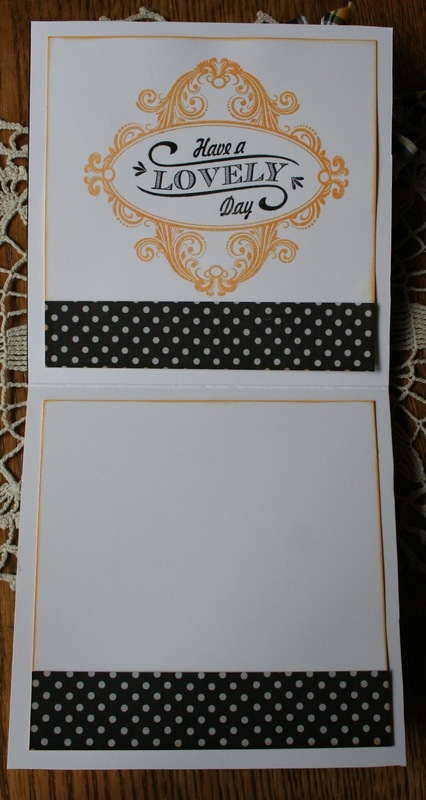 Well, that is the name of the challenge that I am entering this card into.....however the challenge really has to do with using the colors of black, white and yellow more so than a "bee theme." And, seriously, I really tried to come up with a bee theme....tried pretty darn hard but couldn't deliver! Then I remembered this lovely Silhouette stamp set that I had from JustRite Stamps and although I have never inked it up before this card it suddenly became the "perfect" image to do in these colors. Yellow is a color that I don't often work with...if fact I believe I have only begun using yellow very recently so I am not too confident making a card with it. 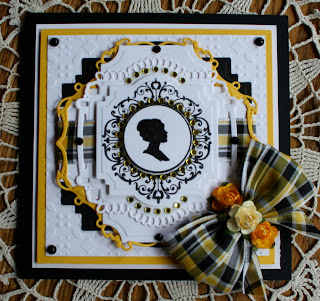 But I thought this "cameo" or 'silhouette" image could be accented very nicely with yellow and besides I had this marvelous yellow and black plaid ribbon that I got on clearance ages ago that would be perfect for embellishing on this challenge! I stamped, embossed and die cut and fussy cut the cameo and surrounding adornment. 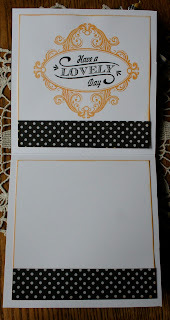 Then I continued to use various Spellbinder dies and embossing folders for the rest of the card. I popped different layers up on foam tape. I colored the bling with a yellow Copic marker and also colored some pale "butter" colored paper roses with the same Copic to match the yellow cardstock. I am entering this card into the My Sheri Crafts Challenge #114 "What's the Buzz". I also finished off the inside with a sentiment stamp set from JustRite Stamps. I love how it looks like it just belongs with cameo card! I did mess up though by putting the border on the bottom of the sentiment portion...oh well! That's why it's called handmade! Thanks for stopping by today! I will fill my blogging buds in on what is/has been happening in my life in another post. I just felt the need, the absolute need to sit down and craft today before I went stark raving mad! Anyone else out there ever get those moments? I hope I am not the only one! Take care all! Pretty card! Hope you are having a great summer!